A common issue this time of year. With the sun rising at 7:45am and setting at 4:45pm, when most of us are at work, no wondering we struggle to get our dogs out to run and play. Combine that with chill temperatures and rain, and it’s a wonder we get outside at all! 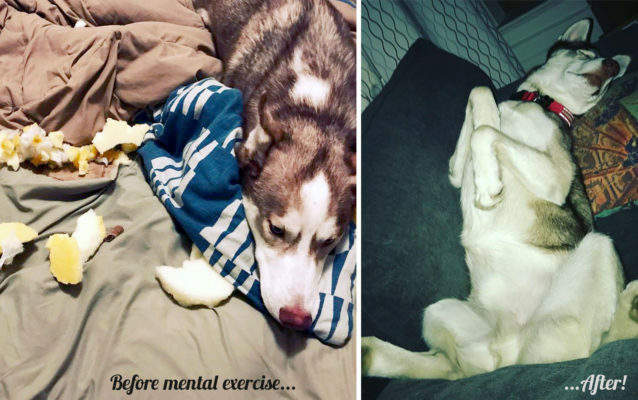 Just because we feel like upping our carb intake and watching Netflix all day doesn’t mean that our dogs got the memo, however. They’re usually just as wild and energetic as usual, but now without the sunlit walks and weekend hikes. The good news is, we’ve got some ways to keep your dogs busy while you stay warm and dry. 1. Behold the power of the puzzle. Winter is a great time to brush up on your dog’s recall. Contrary to popular belief, recall doesn’t require a huge open space to practice in – after all, the goal is for your dog to come back to you no matter where they are or what they’re doing. Throw a treat down your hallway or across the room, and when your dog eats it, call them back and reward them when they get to you. Repeat for as long as you and your dog are having fun! My dog has played this game once a day since I first heard about it for two reasons: 1) she loves it and 2) it’s super easy for me to set up. I scoop up her dinner in a cup, then walk around the house scattering the kibble everywhere. I drop it on the floor, in boxes, under toys/dog beds, and just throw it around. Then I release my dog to go hunt! It keeps her busy looking for food and it’s fun to watch her searching, tail wagging the whole way. 4. Let a professional take them! I like running but I struggle to get motivated to run in the dark, cold and rainy weather. My dog is much happier with a run or two a week. When I discovered the Oregon Ruff Runners, it changed her life and mine. Josh picks her up at my home, runs her three miles, and then drops her back off tired and happy…and he takes the brunt of the brutal weather for me! They provide a fantastic service for busy (or in my case, cold-hating) pet parents, and they’re worth every dollar! Tera’s dogs love to go on outings with Northwest Adventure Dogs regardless of the weather. As their website says, “rain or shine, Adventure Dogs are hitting the trails!” Brianna, the company owner, will pick your dog up and take them on an excursion for three hours, bringing them home dry and happy after a romp in the woods, at the river, or through fields. This gets your dog out and about while you’re at work, and then you can both enjoy a relaxing evening by the fire after a busy day! PS – Let us take a moment to return to our case study: my brother’s dog, Pax. I checked in with him a couple weeks after the unfortunate incident of the bed destruction. He said that they’ve been more diligent about longer walks and play time as well as providing him toys to keep him busy. So far their new bed is safe and in one piece!